in the raw sushi features traditional and nouveau sushi, sashimi and nigiri creations in addition to a full menu of cooked cuisine. We strive to provide a multi-sensory dining experience. 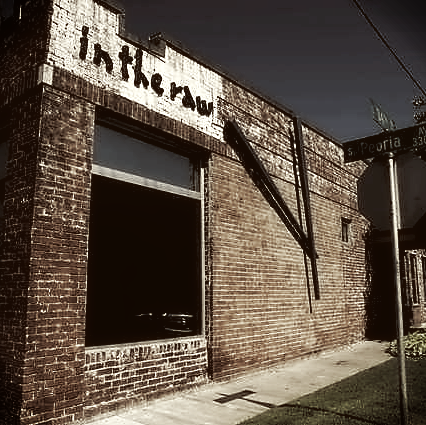 in the raw sushi will be opening a new location in Downtown Tulsa, located on the rooftop of the new Valley National building. itr brookside, a staple located in the Tulsa district known for its fun nightlife, unique shopping, art galleries, desirable neighborhoods and fine dining As the original, itr brookside sets the standard for exceptional service and entertaining experiences. itr on the hill provides a panoramic view of Tulsa. The view is accompanied by a fun atmosphere, amazing food and a dining experience that is second to none. This location hosts numerous private parties and corporate events throughout the year. Whether you are in the mood for something from the sea or something from land, in the raw offers the best of both worlds. Our menu includes plenty of dishes for any occasion. Now open in Broken Arrow's newest hotspot, the Rose District, itr broken arrow offers great street presence and a stellar facility. This location will offer the same quality service that in the raw customers have come to expect. When you want a special night with friends, family or business associates, look no further than in the raw. Let us host your party or bring the party to you with our custom catering services. The in the raw sushi experience is one that you will not get at any other restaurant. While each location has a very distinct style and atmosphere, the overall theme is very much the same. The Brookside district is known in Tulsa for its fun nightlife, unique shopping, art galleries, desirable neighborhoods and fine dining. As the original in the raw location, ITR Brookside sets the standard for exceptional service and entertaining experiences. Located in the Woodland Hills shopping area, this in the raw is known to have the best views in Tulsa. We sit 182 visitors comfortably, with available sitting for large-party events. We are open for lunch on Saturdays, so come joins us after shopping for bite to eat and one of signature drinks! itr downtown will be the penthouse tenant of the new Valley National Bank building located just west of ONEOK field in Downtown Tulsa. With spectacular views, classic flavors and new exciting specials, this is going to be exciting.